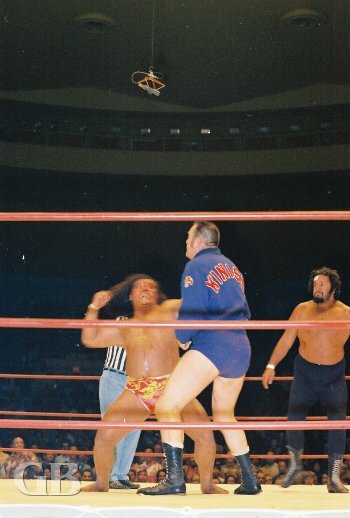 On September 29,1971 wrestling fans at the Honolulu International Center Arena were treated to three main events, a mixed tag team match, plus three other matches. In the opening match, Hahn Lee defeated Rick Rinaldo. In other matches Eddie Morrow won over Rocky Montero and Dino Lanza downed Field Castro. Fidel Castro applies a choke hold on Dino Lanza as referee Pete Peterson prepares to count. In the mixed tag team match Bearcat Wright and Lady wrestler Sandy Parker defeated the team of Harry Fujiwara and Lady wrestler Toni Rose. Harry Fujiwara was a last minute sub for Cyclone Negra. The mixed tag team of Harry Fujiwara (the future Mr. Fuji) and Toni Rose. Sandy Parker has control of Toni Rose from behind. Bearcat Wright about to body slam Fuji. The first main event featured The Sheik vs. Peter Maivia. 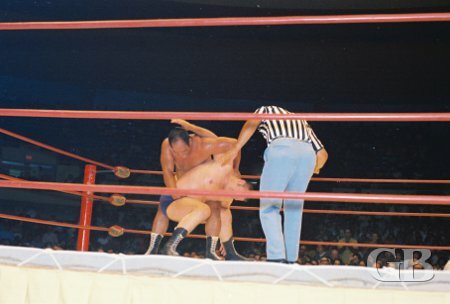 During the match as Maivia had the upper hand on the Sheik, wrestler Gene Kiniski came to the aid of The Sheik. As Kiniski and The Sheik were working over Maivia, wrestler Curtis Iaukea came to the aid of Maivia. As all four wrestlers continued to battle in the ring the referee disqualified both The Sheik and Peter Maivia and the match was declared a no-contest. The results of this match lead promoter Ed Francis to order that the next Honolulu International Center wrestling card would feature a tag team battle of The Sheik and Gene Kiniski versus Peter Maivia and Curtis Iaukea. 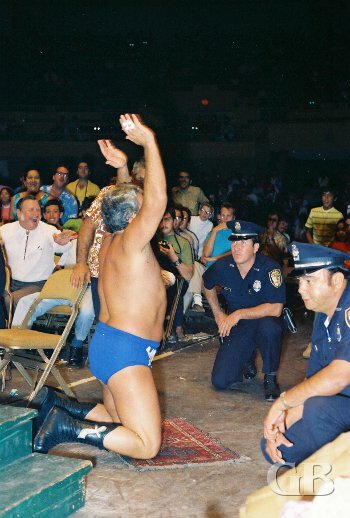 The Sheik delivers a pre-match prayer on his little mat as Honolulu's Finest watch. 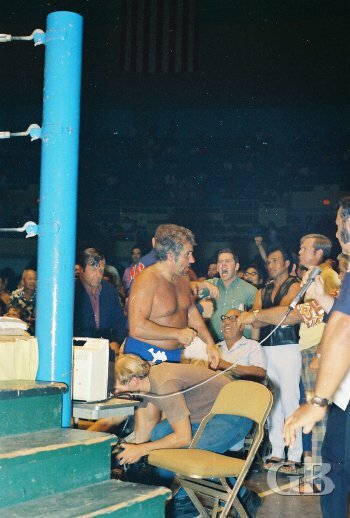 The Sheik takes a breather outside the ring among the irate fans. That's promoter Ed Francis behind him. 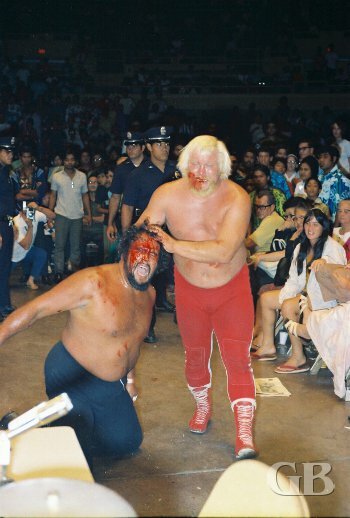 The Sheik bites Peter Maivia on the forehead. Peter Maivia about to bash an interfering Kiniski with Curtis Iaukea still in the ring. The next match was for the North American Championship with Gene Kiniski putting his title on the line against Hawaii's own Sam Steamboat Mokuahi. Back on April 24, Kiniski had defeated Steamboat to win the title and after months of chasing Kiniski, Steamboat finally got a rematch. 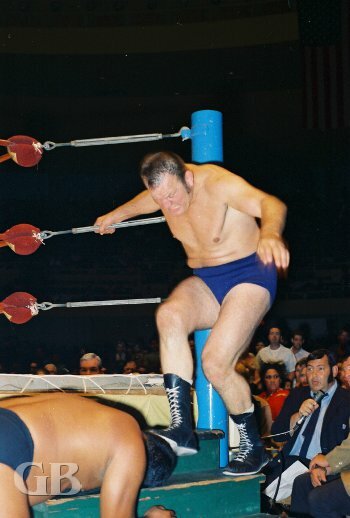 Big Gene Kiniski stomps on Sam Steamboat's head on the ring stairs. In this title match, Steamboat took two out of three falls from Kiniski to regain the North American Championship. Sam Steamboat applies the abdominal stretch on Gene Kiniski. 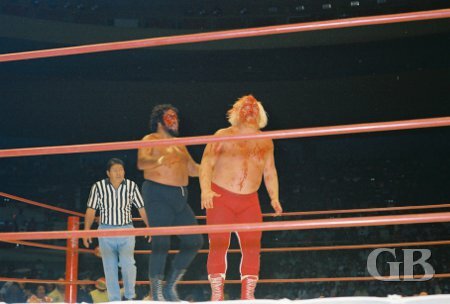 The main event was a grudge match between Curtis Iaukea and Maddog Mayne. As Mayne entered the ring, he was attacked by Iaukea. Both wrestlers began battling each other both inside the ring and out. Once outside the ring, both wrestlers remained fighting outside as the referee started the mandatory 20 second count to return to the ring. Iaukea and Mayne continued battling on the arena floor as the count reached 20. Both wrestlers were counted out and the referee declared the match a draw. 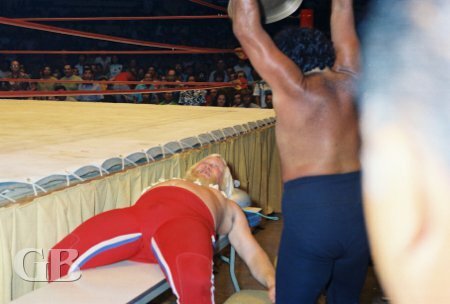 Curtis Iaukea about to bash Maddog Mayne with a steel chair on the timekeeper's table. Both bleeding, Iaukea and Mayne stagger toward the middle of the ring. Mayne and Iaukea once again battle outside the ring. Maddog Mayne hung upside down on the ropes.